The Spotlight screen shows matching results, separated by category. You access the Spotlight feature by going to the iPhone’s Home screen and then swiping to the right; in other words, by navigating to the screen to the left of the Home screen. Alternatively, you can press the Home button when on the Home screen, or, using the Settings app, configure your iPhone to open Spotlight whenever you quickly double-press the Home key. You’ll see a search field at the top of the screen, and the iPhone’s onscreen keyboard will appear at the bottom. Begin typing your search term, and in a few seconds results will start to appear on the screen. 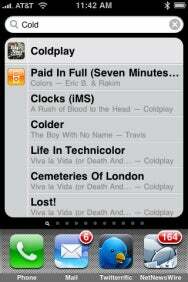 By default, Spotlight searches your applications, contacts, notes, e-mail messages, calendar events, and iPod content. 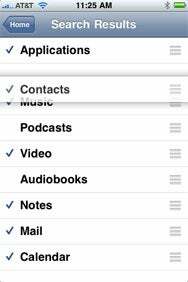 Your search results are grouped by these item types: audio files in the iPod app, e-mail messages, Calendar events, and so on. You can change the order in which Spotlight search results appear. As the first item in that list shows, Spotlight isn’t limited to finding data; it can also be used to quickly find apps and WebClips. Just type the first few letters of the name of the desired app or WebClip, and then tap on a resulting item to launch it. If you’ve got lots of apps installed, this makes Spotlight a quick and easy way to launch a particular app buried on one of your iPhone’s many screens. 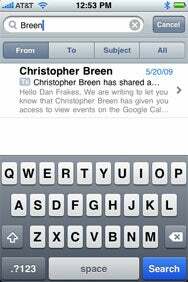 In addition to using the Spotlight screen to search your entire iPhone, Spotlight can be used within several apps; specifically, Calendar, Contacts, iPod, Mail, and Notes. By using these app-specific Spotlight interfaces, you can limit your search to each app’s particular type of data; in addition, some apps provide options for fine-tuning your search. Searching within Mail lets you restrict your query to the From, To, or Subject fields of messages. For example, when using the search field in Calendar, Contacts, iPod, or Notes, your results are limited to the contents of the respective app, so you aren’t distracted by unwanted data. The iPod app goes one step further by grouping your results into artists, albums, songs, movies, podcasts, podcast episodes, and so on. In addition, Mail offers several search filters, letting you limit your search to message subjects, senders, or recipients. (Unfortunately, even when searching within the Mail app, Spotlight doesn’t search the body of e-mail messages.) And for Exchange, MobileMe, and many IMAP servers, a Continue Search On Server option appears at the end of your list of results; tap it, and Spotlight will expand your search to messages on the server that you haven’t downloaded to your phone. Unfortunately, and unlike Spotlight in Mac OS X, Spotlight on the phone can’t search for, or within, data in third-party apps.